We’ll admit that we’ve been pretty impressed with Gwyneth Paltrow’s collaboration with Juice Beauty, as the brand has definitely taken organic skin care to a whole new level. And while Juice Beauty already has makeup and skin care products available, the brand now is adding a new Green Apple Brightening Essence to their ever expanding organic beauty collection. Fighting discoloration and dark spots, the newly launched essence helps to brighten your skin with ease. A cocktail of peptides, Vitamin C, alpha lipoic acid, and green apple help clarify the skin and kick redness and inflammation to the curb. And always formulated with organic ingredients, this product is ideal for those who want to stay away from toxic beauty products, especially in the summer months, when your routine is supposed to be lighter. "The new Brightening Essence is a wonderful addition to the Green Apple skin care collection — it is gentle and kind to the skin, but containing active ingredients that target hypo and hyperpigmentation for beautiful results and promoting a visibly even skin tone." Much like those K-beauty brightening essences, we can’t stop talking about, the Green Apple Brightening Essence is best applied after you wash your face. And unlike most toners, which can strip your face of its natural oils, this bad boy leaves a thin veil of moisture on the skin from polysaccharides of the tamarind seed. 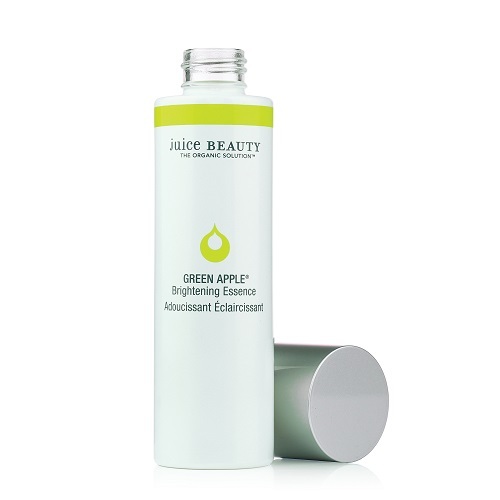 The Juice Beauty Green Apple Brightening Essence is now available at Credo for $35. This lovely skin care gem is sure to be your next summer beauty favorite.